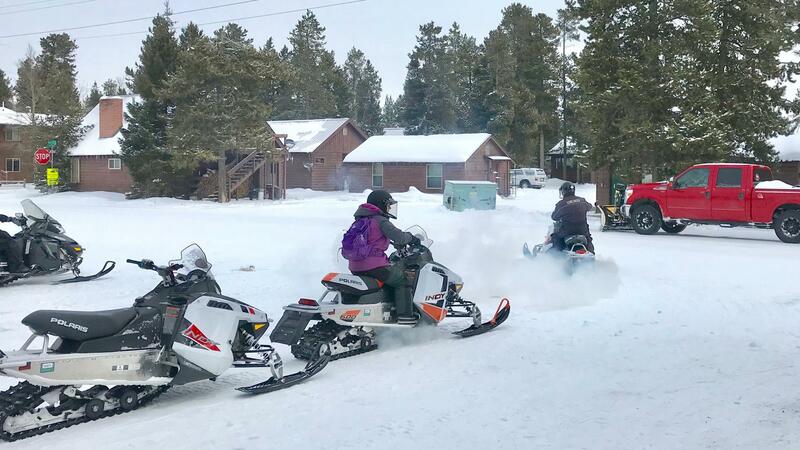 Between 20,000 to 30,000 people visit Yellowstone National Park each month in the winter, many to snowmobile the park's groomed roads and trails. To keep the park open during the shutdown, local hotels have teamed up with concessionaires to pay park employees to plow and groom roads, as well as to clean bathrooms. 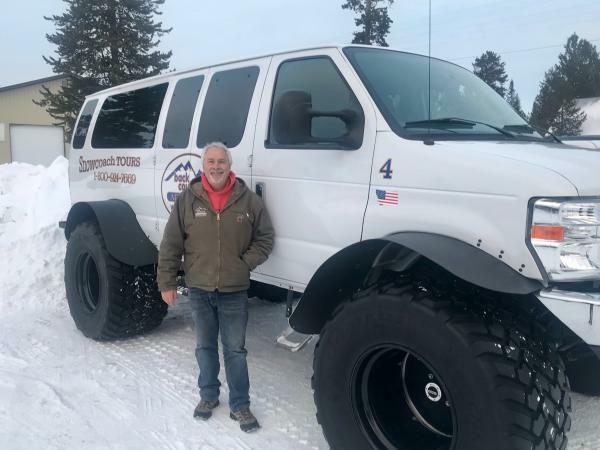 Jerry Johnson owns a business that rents snowmobiles and sends seven guided tours a day into Yellowstone National Park in the winter. His company is paying about $300 a day to help keep roads open and groomed during the partial federal government shutdown. 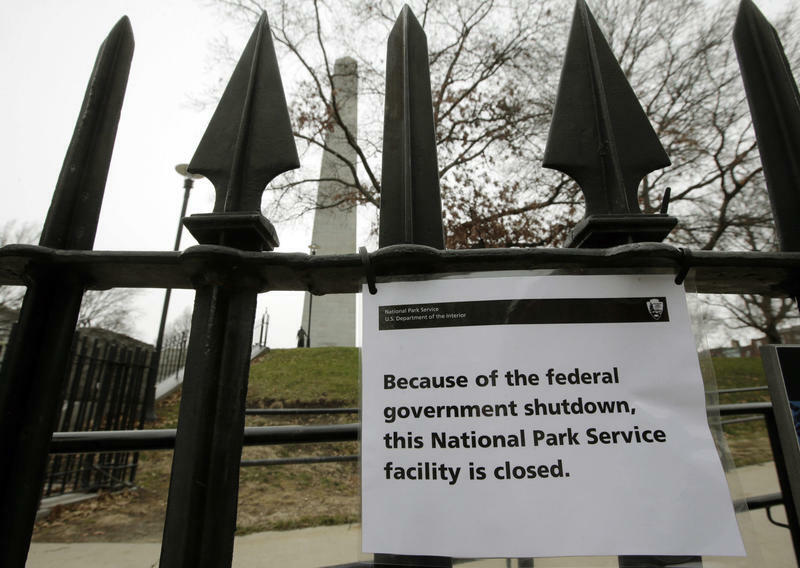 Two weeks into the government shutdown, National Parks are starting to close. The public has been getting free access, since there are no employees to collect entrance fees of up to $35 per car. But neither are employees there to collect trash and clean bathrooms. So, with overflowing trash cans and toilets posing a threat to human health and safety, parks are shutting down. But in the nation's oldest national park, Yellowstone, local businesses are pitching in to pay park staff to keep it open — or at least parts of it. Temperatures in the park regularly drop below zero this time of year, and the park is blanketed in snow. But still, between 20,000 to 30,000 people a month still come to Yellowstone in wintertime, and the snow is actually a big attraction. Snowmobiles are as common as cars on the frozen streets of the park gateway town of West Yellowstone, Mont. Dan Gibbons from nearby Bozeman had family in from out of town for the holidays, and booked a snowmobile tour from here to Old Faithful geyser. The best part of his trip, he said, was seeing the kids' reaction to the sights. "The trees next to the geysers are covered in ice crystals, I could show you some pictures, it's brilliant!" he laughed. Jerry Johnson owns a business that rents snowmobiles and sends seven guided tours a day into Yellowstone in the winter. He calls it 'the trip of a lifetime.' When the shutdown began, he received a big spike in phone calls from people who had already booked trips, and he didn't want to tell them their Yellowstone adventure was cancelled because politicians in Washington D.C. couldn't resolve their differences. "I mean it's not cheap," Johnson said, "They had to plan and budget for this, and to all of a sudden get the carpet ripped out from underneath them, I think is not fair." The park is almost entirely closed to cars starting in November, so the only way to get to Old Faithful and most of the other park attractions is via snowmobile, or in big vans with cartoonishly huge balloon tires called snowcoaches. They require roads that are groomed daily by the park's fleet of half-a-dozen big tractors — kind of like the Zambonis that smooth out ice skating rinks, but a lot bigger. "If you don't groom," explained Johnson, "the trails will get very rough, and you get bumps, moguls, in them, and it'll be — it's just miserable." So, during the shutdown, private businesses that operate inside the park are picking up the tab — about $7,500 dollars a day to groom Yellowstone's 300-plus miles of snow-covered roads, and to keep one paved road open to cars. 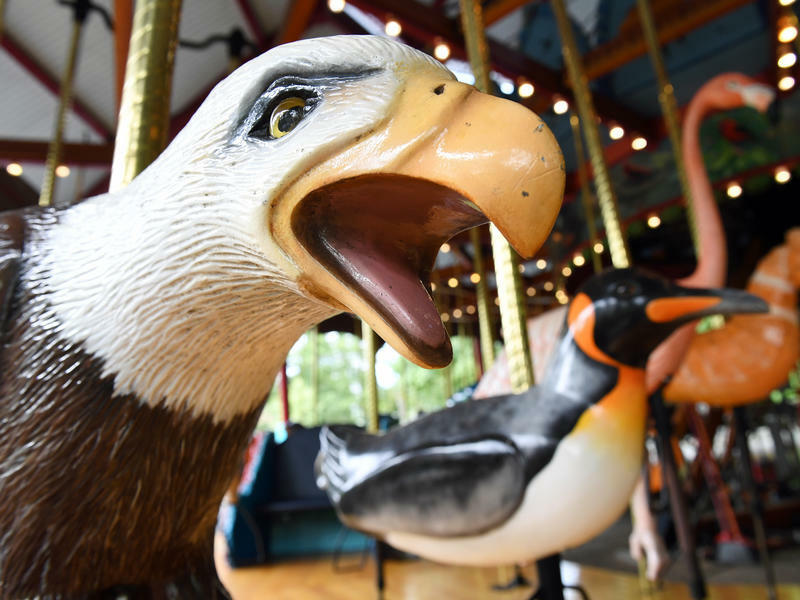 Xanterra Parks and Resorts, which runs the only hotels operating inside the park in winter, is paying most of that — paying park service employees to perform the same grooming duties they do under normal circumstances. Xanterra asked the 13 guide services that operate in the park to chip in to help pay, and all of them did. It adds up to about 300 bucks a day for each of the guide services. And will the Park Service reimburse them for paying park employees during the shutdown? 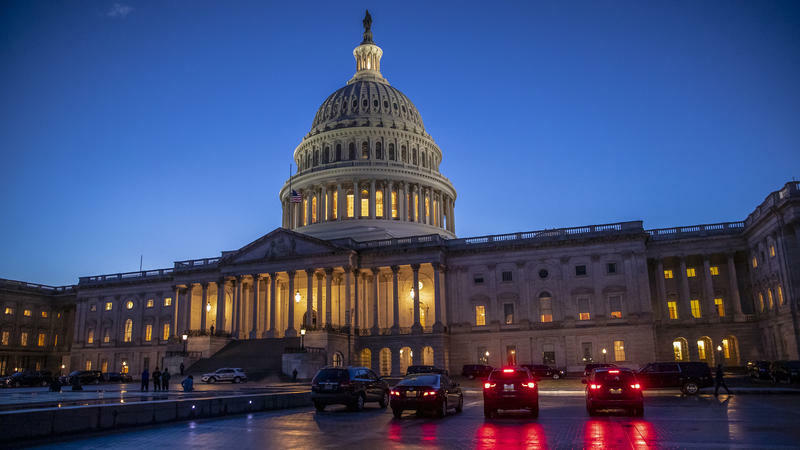 "There is no reimbursement from the government after the shutdown ends," says Mike Keller, Xanterra's general manager in Yellowstone, "The funds that we pay operate for those days. We won't be reimbursed the dollars that we've committed for the previous 14 days." Nor is Xanterra getting reimbursed for the half-dozen of its own employees who are cleaning park bathrooms during the shutdown. Snowmobile guide services like Jerry Johnson's are packing in their own toilet paper, and packing out all their trash. Johnson says they're happy to keep the park open and clean. "It should be open, and services should be there, because it is the people's park," he says. Xanterra Resorts says they're willing to keep paying park employees to maintain winter access to Yellowstone into February, at which time they'll re-evaluate the funding arrangement with their fellow concessionaires. WHITNEY: Xanterra resort says they're willing to keep paying park employees to maintain winter access to Yellowstone into February, at which point they'll re-evaluate the funding arrangement with their fellow concessionaires. For NPR News, I'm Eric Whitney in West Yellowstone, Mont. Transcript provided by NPR, Copyright NPR.